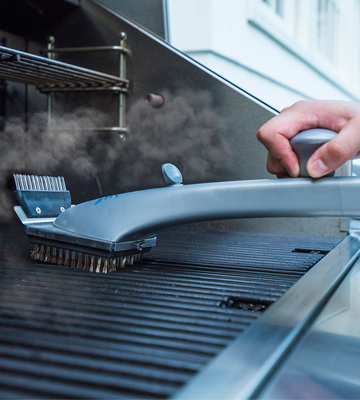 The brush creates the steam that cleans and sanitizes the grill surface. The on/off valve could be closer to the handle. 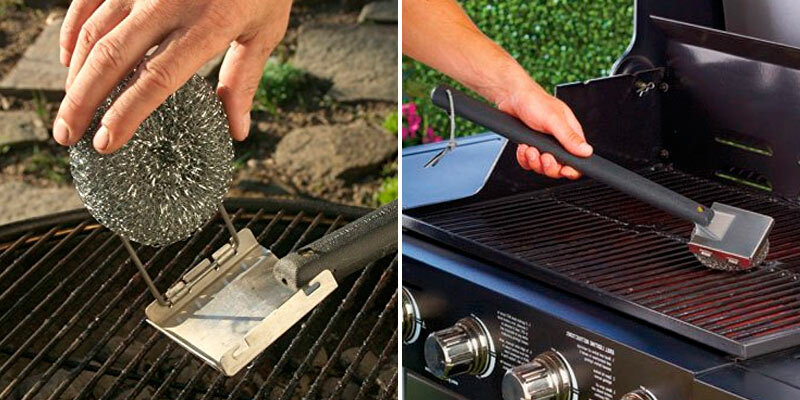 It's an amazing BBQ brush that will help you quickly and effortlessly clean the grill grates made of stainless steel, cast iron, or porcelain. The metal scraper on the end will let you scrub big chunks off your grill. The plastic head might melt if you clean an overly hot BBQ grill. 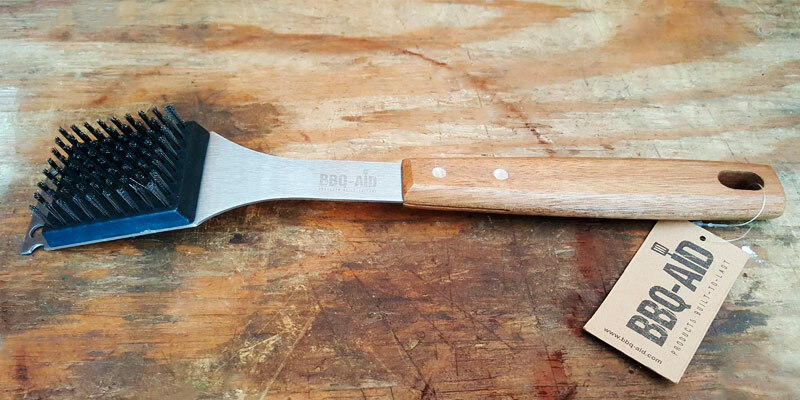 The BBQ-Aid grill scraper will serve for years to come. It easily removes even the toughest food residue and baked-on messes. 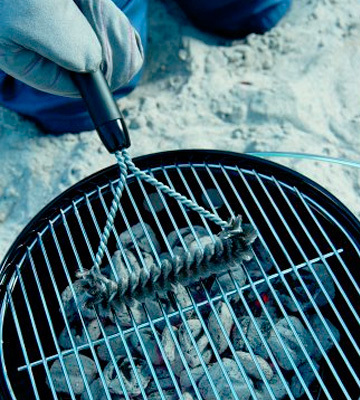 Incorporating 3 brushes in one, it will clean your grill 5 times faster than most common brushes. It isn't very good for small grills. This is an ideal tool for those who need something super gentle yet effective. 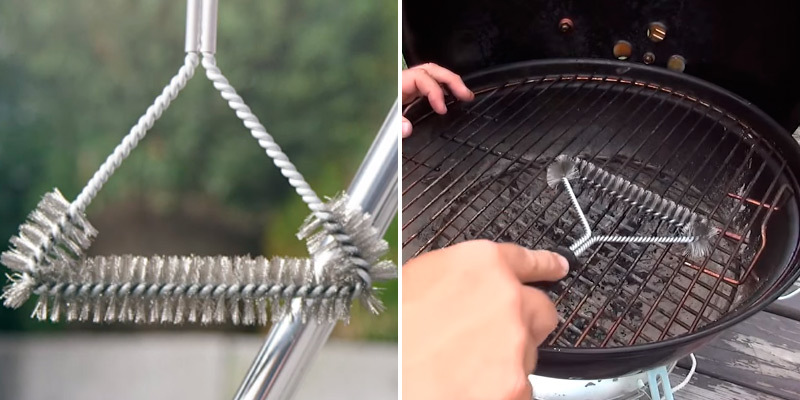 Made of a woven steel wire, it will never scratch your grill. 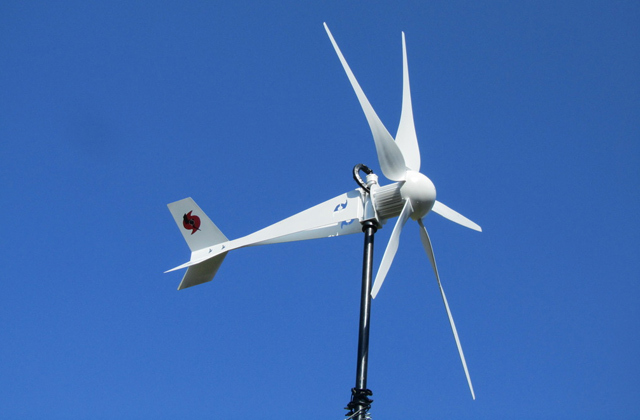 The tool is compact and easy to maneuver. 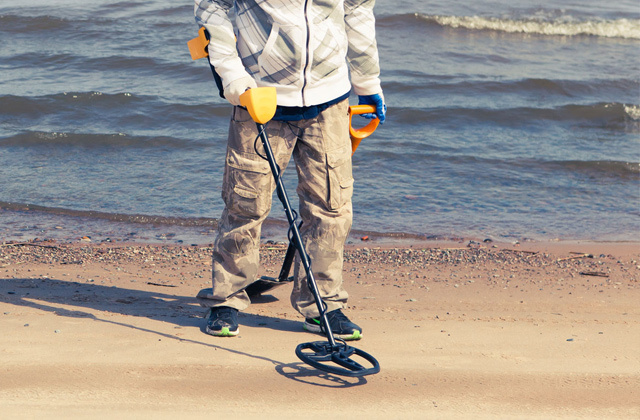 It can clean any hard-to-reach area. The handle is too short. The Weber brush is the best option for small grills. It scrubs well between the gratings, leaving the grill surface amazingly clean. 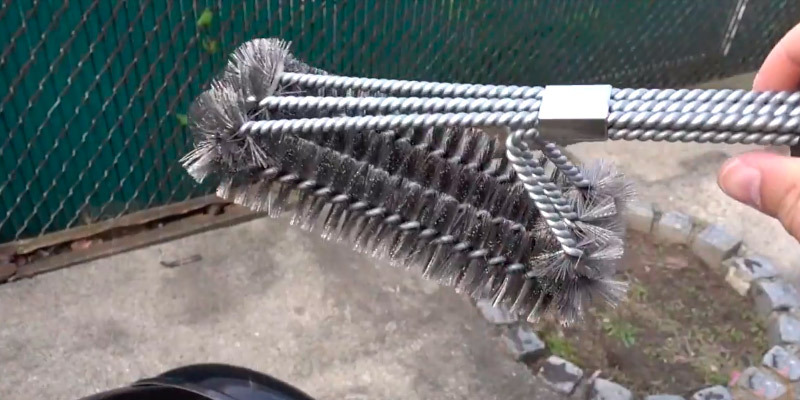 This grill cleaner uses replaceable non-abrasive woven scouring pads. The pads become cruddy rather quickly. 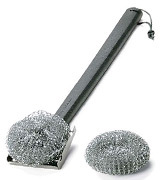 An excellent grill scrubber with an excellent handle length! The Tool Wizard brush can reach any corner and scrape off all greasy bits and grime. The Grill Daddy grill brush really does wonders effectively scraping away grime, grease, and charred buildup. It makes BBQ clean up an easy job. Even without scraping and using chemical-based cleaners, you can get your grill grate sparkling like the brand new year after year. The thing is that the brush uses the power of hot steam. 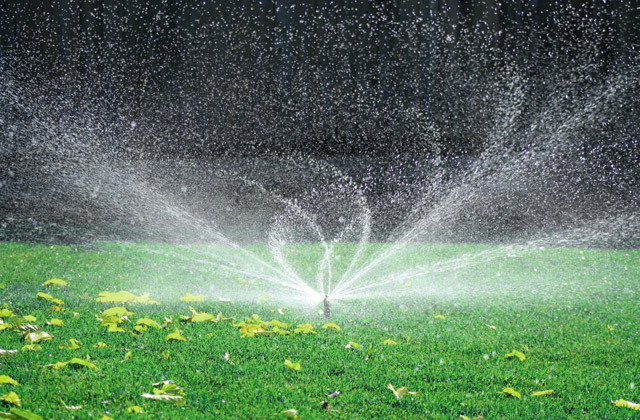 Just fill the brush with water, open the water spigot, and go. 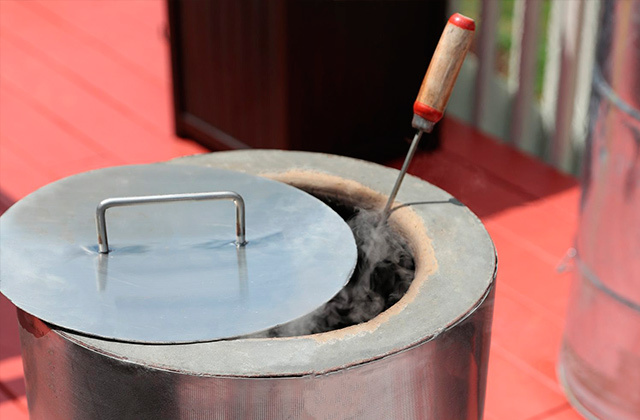 The steam will melt away all food residue in a matter of minutes. Moreover, it will sanitize the grill surface as well. The tool features two stainless steel brush heads that are safe for porcelain, steel, and cast iron grill grates. The smaller brush is great for cleaning in-between the grill lines and other hard-to-reach places, while the bigger head works for large surfaces. At 22 inches, the tool provides amazing leverage and keeps your hands safe from the heat, thus allowing you to scrub your grill when it's still hot. This brush is a real beast! 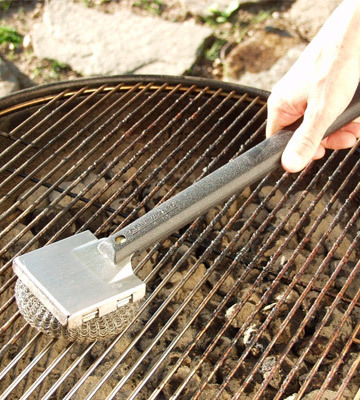 The grill cleaning brush by BBQ-Aid will be an excellent addition to your grilling tools and accessories! 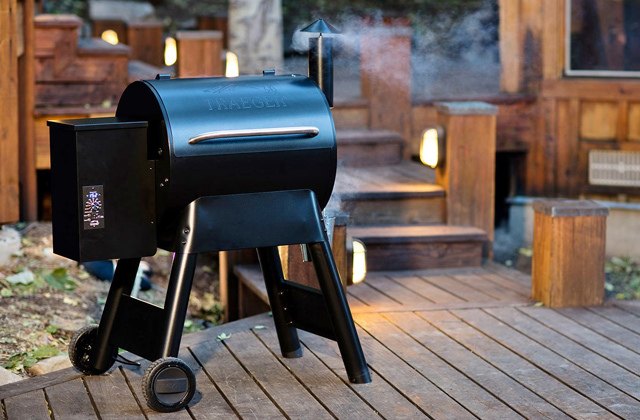 The acacia wood handle allows you to easily reach any part of your grill. 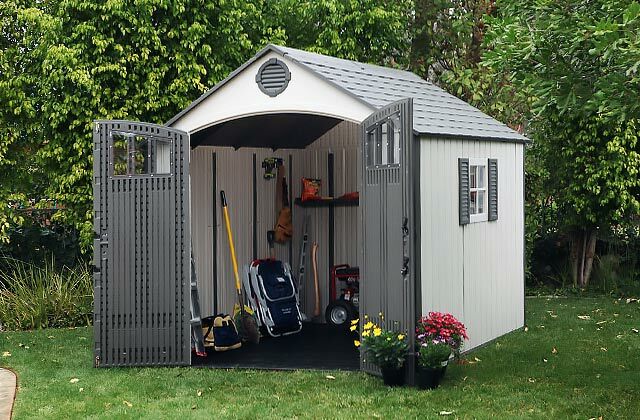 It's not too short and not too long, so it provides a great balance of leverage and safety. 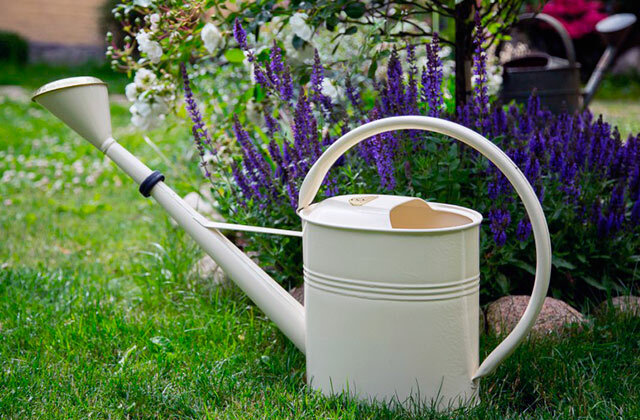 The handle is very sturdy and has a comfortable wooden grip. It won't break or bend no matter how hard you'll be pushing on it. 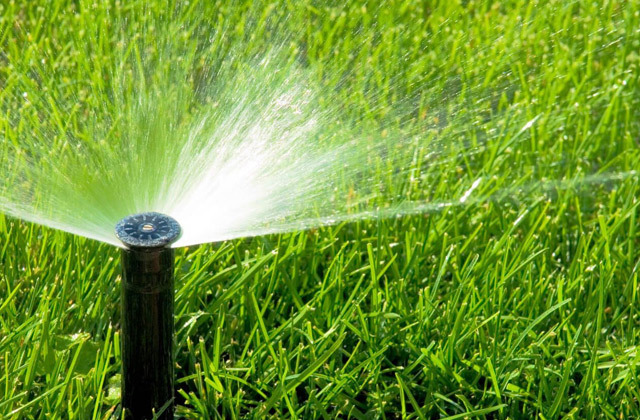 This is a tremendously effective tool that easily tackles every bit of residue. The only thing to keep in mind is that the metal bristles are anchored into a plastic plate. So, keep it away from extremely hot grill grates, otherwise, it might melt. The stainless steel bristles are quite durable and can scrub all the caked-on food particles and grease off your barbecue's grate. When they become too cruddy, you won't need to buy another brush. Just replace the plastic head. The cooking is finished and now you have to scrape away the sticky burned-on mess from the seasonings... Sounds quite challenging? The Qually United 3-in-1 brush is a real game-changer! 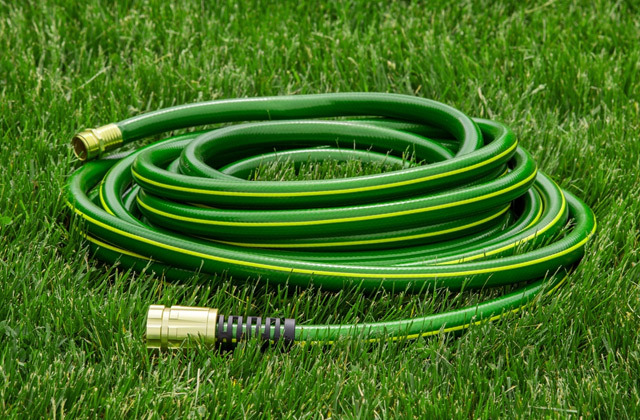 Due to the long 18-inch handle, it can easily get in all those nooks and crannies. The handle is very solid and it has a great shape and angle. You can comfortably grasp it with both your hands and apply as much pressure as you need to clean your grill. 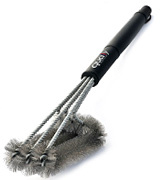 The manufacturer claims that this triple BBQ brush with lots of bristles pointing in every direction can drastically speed up the cleaning process. 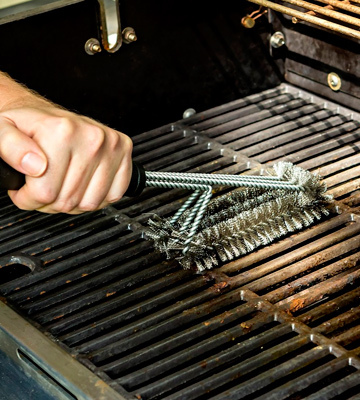 It will help you clean the grill grates five times faster than a conventional brush! The bristles are very strong; they are made of woven steel wire and won't scratch a surface. That's why the tool can be used with almost all types of grills. 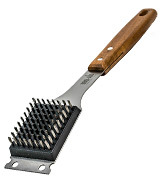 An amazing BBQ brush at an amazing price! 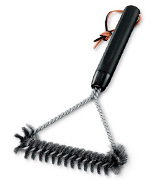 If you are looking for a compact and maneuverable BBQ brush, this model is a real catch. Due to the small size, it's extremely effective for cleaning in-between the grill gratings. The brush has a short plastic handle that's comfortable to grip. Note that if you need a longer option, you can choose a 21-inch model as well. This BBQ grill cleaner is exceptionally strong and its thick bristles won't bend under the pressure you'll put on them. The bristles are produced from durable stainless steel, meaning they will stand the test of time. This fantastic brush removes the grease with ease and leaves the grill surface sparkling clean in record time. We would like to point out that the Welder brush will take little space in your deck box. However, if you wish, you can simply hang it on the side of your grill (it's equipped with a handy strap). 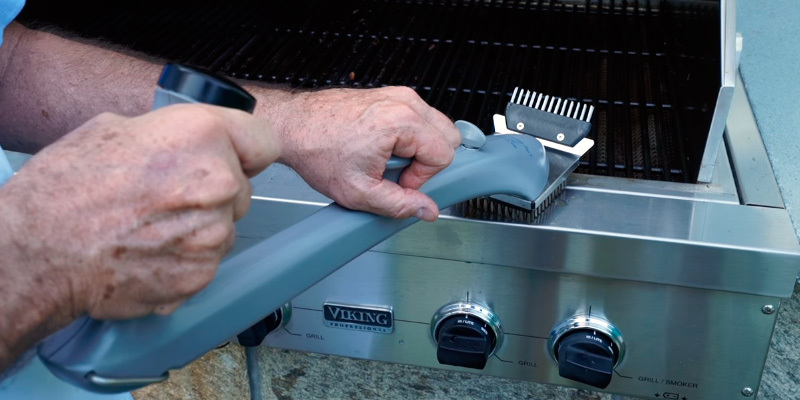 This grill wizard is the only BBQ cleaning tool you will need within several grilling seasons! 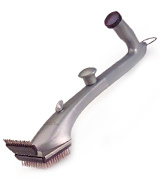 Case in point, the brush features a durable stainless steel handle and replaceable scouring pads. No more will you need to replace the whole brush when its head has worn down. Just change the pad! The scrubbing pads are cheap and easy to set up. The great news is that the brush already comes with two scrubbers. 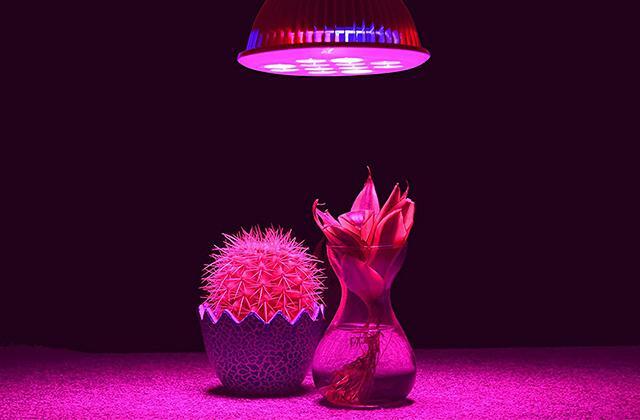 They are made of non-abrasive woven mesh, meaning no wire pieces can end up in your dinner. Moreover, these scrubbers claim to clean better than brass bristles. Yet, they're very gentle and perfect for almost any grill grates including those made of stainless steel, ceramic, and even porcelain. The only surface they mustn't be used on is Teflon. Overall this grill cleaner is very comfortable to use. A long handle gets into the tight corners and keeps your hands far from the heat. Safe, effective, and durable! 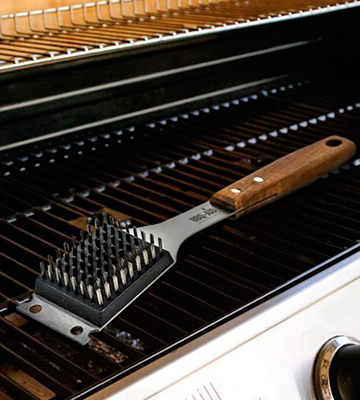 A BBQ brush is a must have for serious grillers. It's a simple brush with metal bristles or scouring pads that will remove plenty of debris. 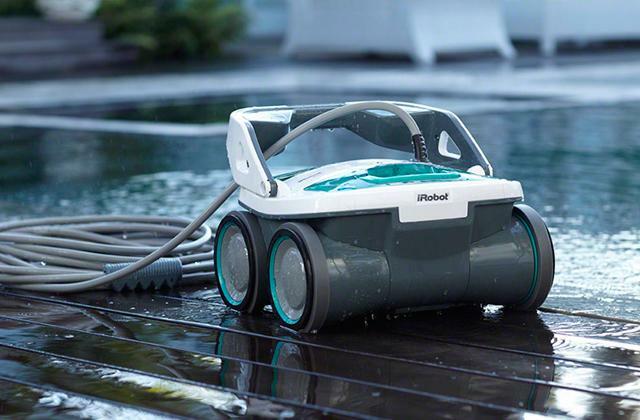 It can make cleaning effortless no matter what is stuck to your grill. A good brush will easily scrub even the baked-on grease and stubborn food residue off your electric or charcoal grill. So, if you want to get a sparkling grill before and after your BBQ parties, choose one of the best brushes available on the market. Treat your guests to delicious, grilled cuts of beef, burgers, and hot dogs! It's also a good idea to buy a cover for your grill. 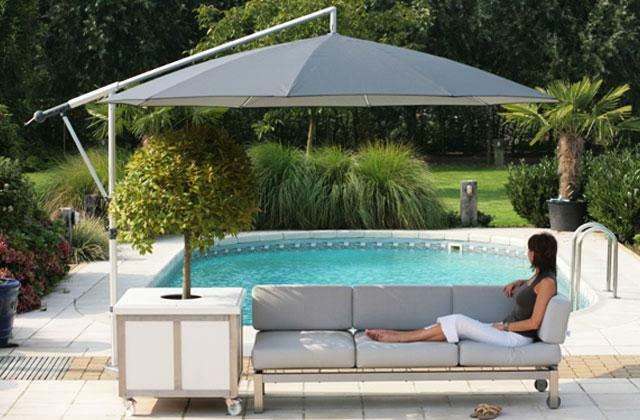 It can protect your barbecue from the elements and keep unwanted insects off your grill. 1. Derrick Riches Keeping Your Grill Clean for Better Cooking, The Spruce. April 4, 2017. 2. Derrick Riches Alternatives to Wire Grill Brushes, The Spruce. March 14, 2017. 3. Jeremy Anderberg How to Clean and Maintain a Gas Grill, Art of Manliness. May 14, 2015. 4. How to Clean Grill Grates, wikiHow.